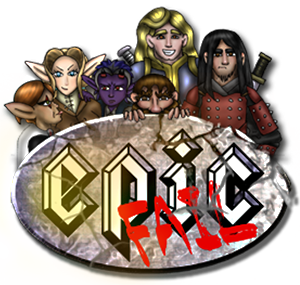 Epic Fail is a comedic fantasy webcomic based on Dungeons and Dragons. It is a long-form, character-driven comic of funny fantasy misadventure. Art and story by Amy Letts. Epic Fail’s heroes are known as ‘The Shieldless’ and comprise of Amuletts, Martin, Clodin, Dirk and Tinuvielle. Epic Fail’s central character is Amuletts: An untrustworthy Rogue and Loki fanatic dedicated to causing chaos, who just happens to have a crush on Dirk, the Paladin: paragon of Law and Virtue. A Mage sets them on a quest to retrieve a Key to a Spellbook.